Well, my favorite month is here, and not just because it brings my birthday! September means crisper days and cooler nights, the return of jeans, sweaters, and even wool socks. 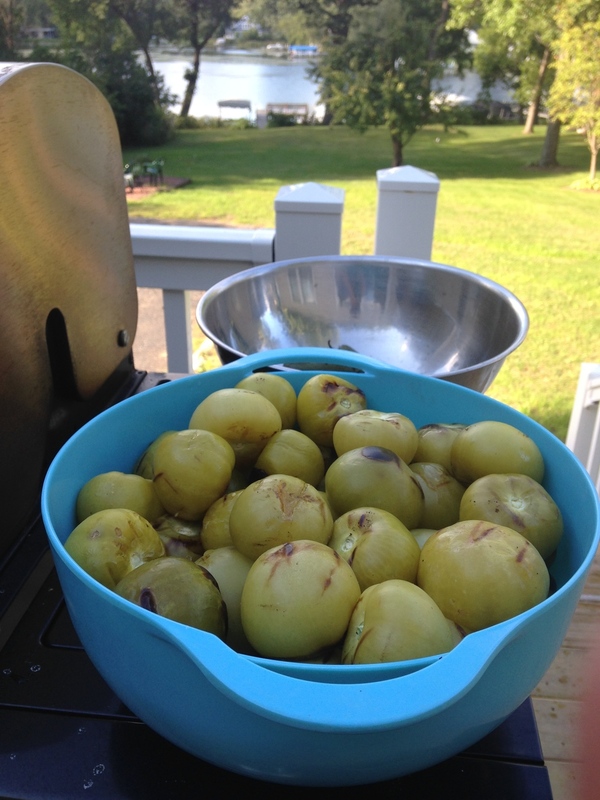 September means apples, campfires, and the return of roasting weather! Pretty soon, I’ll be able to turn the oven on without dooming myself to a stifling house! On the farm front, we’ve just finished up seeding the last of the fall greens - direct-seeded spinach and arugula, plus the last round of transplanted lettuce. 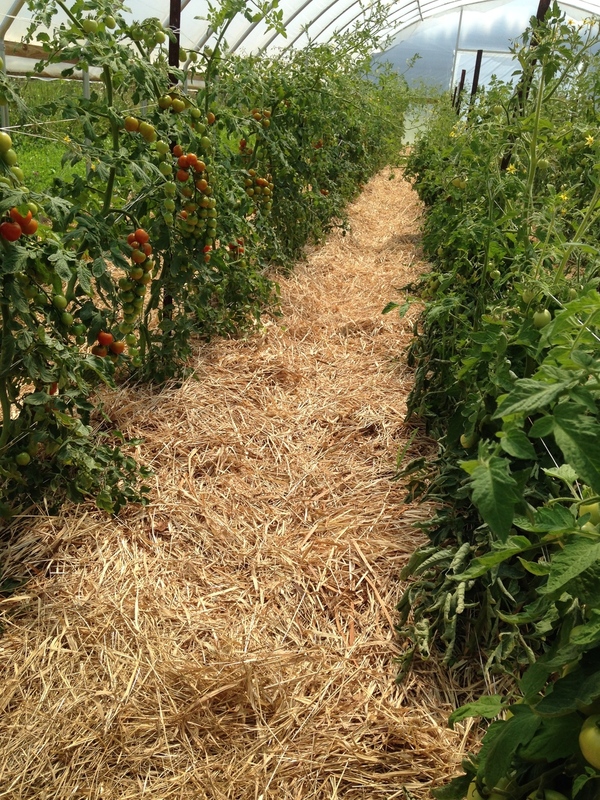 We’re starting to talk about the fall plan to transition the hoop house from tropical tomato heaven to a stash of slowly growing greens for the middle of the winter. We still have a few weeks worth of tomatoes in the hoop house, but we have to make sure the greens get a good start before the winter cold slows their growth altogether. We also harvested some carrots this week, which was more exciting than it should have been. Our spring carrot crop was engulfed in weeds, so we harvested for only a few weeks before we had to mow and till in the weeds. So right now we’re harvesting the first good crop of carrots this year, with two other seedings following behind. The middle seeding needs to be “saved” from weeds, but the last seeding is currently clean. Carrots are tricky, because they take cannot be transplanted and take quite a long time to germinate. That means that weeds have a head start, because they are usually fast to germinate, quick to grow, and set seeds before you even realize they’re there. Well, that might be a bit of an exaggeration, but not by much. It always strikes me as odd that some of the crops that are the hardest to grow under weed pressure, like carrots and onions, are usually some of the cheapest to buy conventionally in the supermarket. If you priced your carrots reflecting the amount of work it took to get them all the way to market, people would look at you like you had a carrot for a head. There are, of course, always ways to improve your systems, but that assumes you’ll have the time to devote to weeding right when the weeds demand it. These are the things I think about! If anyone is wondering how my new adventures in babysitting are going, I’m not really going to dwell on that job too much on the blog - minors, privacy, etc. I’ll just say that things are settling down in the house, and I’m sure we’ll be falling into a rhythm as the school year and the fall progress. I’m constantly reminded of things I’d forgotten about being a teenager, and suddenly the last ten years seems like an eternity. I don’t think about my current self and my 17-year-old self as too dissimilar, but from this vantage point, the gulf seems very wide indeed. This year will be an adventure, one way or another, and in the meantime, you can picture me driving a motley crew of kids around in a minivan, lamenting their long showers, and buying ungodly amounts of bananas, peanut butter, and orange juice. This week on the farm found me recovering from last week’s farm feast, moving into a new house, preparing for a new job, and driving to and from the Twin Cities to celebrate the marriage of a good friend from college. It was great to see some great friends I haven’t seen in a long time (plus some I’d seen quite recently), and the wedding was the classiest wedding I’ve ever been to. From the dress to the drinks to the venue to the swing band, every detail was simple and perfectly reflective of the happy couple. I didn’t get to spend too much time poking around Minneapolis, nor did I have the energy to make it to the State Fair, but what I did get a chance to see while riding a rented bike around on Sunday morning made me want to come back to keep exploring. As for the international students, more on that next week, and in the meantime, I’m about to send them off on their first day of school! This week on the farm found me dragging a bit. You know how sometimes you have so much fun activity on a weekend that you need another weekend right afterwards? Well, that was this week, but instead of another weekend, I had a very taxing week. Monday was filled with garlic, cleaning, bunching, and hanging the garlic that we harvested last week. Knowing how full the rest of the week was going to be, I pushed Danielle to finish the job with me before I left after an eleven hour day. Tuesday brought a film crew to the farm - Inga Witscher’s show Around the Farm Table filmed an episode that will be airing this fall on Wisconsin public television. 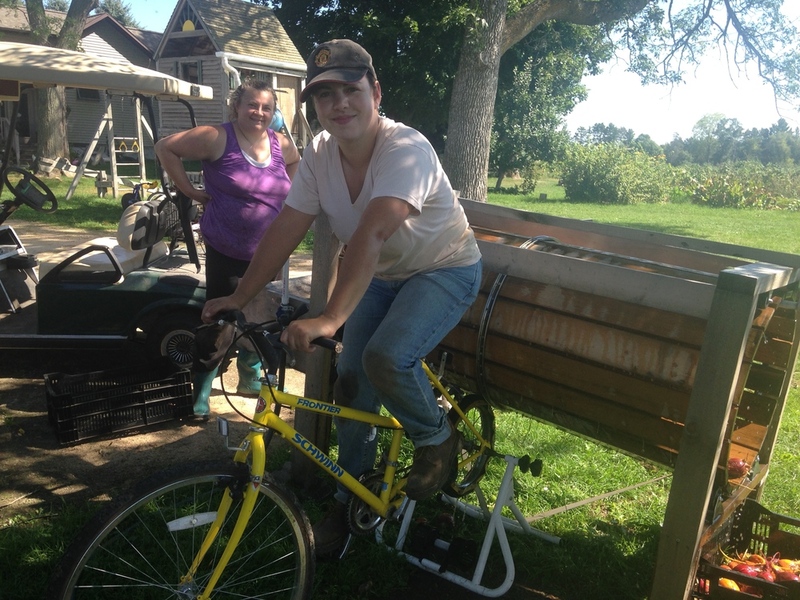 Inga is a dairy farmer that goes around the state learning about other family farms and local food businesses, and she came across the Boersons at a library panel over the winter. Though the filming didn’t take overly long, it did take time to prepare and was maybe more mentally exhausting than anything. Wednesday is CSA day as always, and we had quite a busy morning harvesting, packing boxes, and preparing for the Princeton market. Last week’s market was very very underwhelming, with record poor sales due to low customer attendance and a new vendor with piles of cheap conventional vegetables. Apparently, they didn’t think the market was worth it, because they weren’t back this week and I had a great market. Thursday brought some extra livestock chores, followed by some welcome weeding and cultivation time. We rubbed down the sows with some lice soap, and then castrated the four male pigs out of the eight that were born a few weeks ago. Friday is another market and harvest day, and this week there were some complications that made the harvest a bit more harried than usual. Phoebe, Danielle’s 14-year-old dog, has had bone cancer for the past few months, and it became clear that her quality of life had rapidly deteriorated over the past two days. So Danielle spent the morning going back and forth to the vet and burying her. That left harvest to me and our three usual Friday helpers. I must have really kicked it into high gear, because by the time Danielle joined us just before lunch, we were bagging, quart-ing, and bunching the last few things for market. On the lighter side, we had another new little fuzzball arrive first thing in the morning. It’s another little heifer calf, almost identical to little Tootsie. We’re thinking they’re both half Highland half Devon, but we’ll see just how fuzzy they get as they get a bit older. So that was my week. It flew by, and boy was it exhausting. This weekend, I’m going to try to start a big batch of fermented pickles with the bumper crop of cucumbers we’ve been blessed/cursed with, read a bunch, and basically relax. Next weekend, the Boersons leave for a few days vacation up in the Apostle Islands on Lake Superior. That leaves me to hold down the fort, with the help of the small army of hardworking volunteers and loyal friends. So this will be my only chance to relax for awhile. Besides our usual pattern of harvests, and a brief heat wave, the big story this week is that we harvested our garlic. 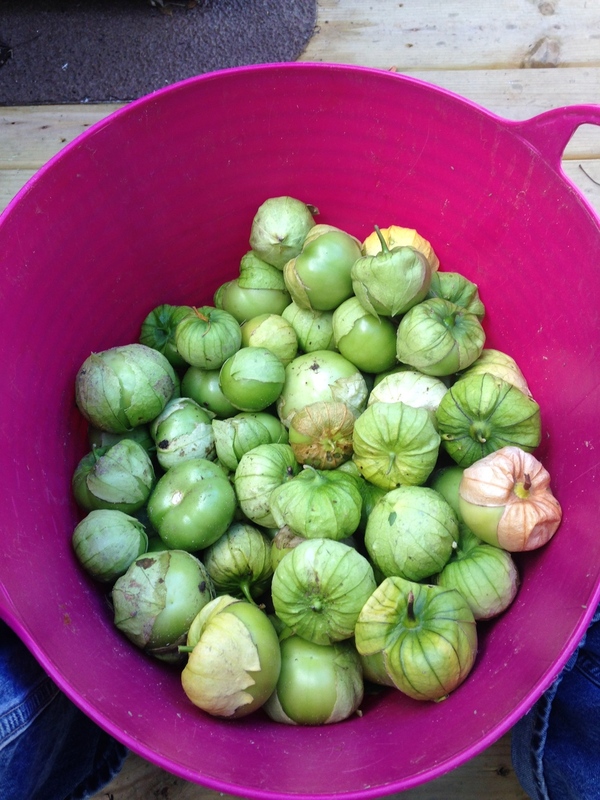 There’s something very gratifying about harvesting a crop that’s been in the ground since last year. Those little cloves were in the ground starting to grow last October, so they’ve survived from lots of degrees below zero during a very cold winter and mercury approaching 100 just earlier this week. I’ve been slowly making my way through Ron L Engeland’s Growing Great Garlic, and I was insufferable all week quoting “that dude.” Garlic just out of the ground is green garlic, but has to be cured in a warm, dry, airy place for a few weeks before it’s the garlic we know and love. We haven’t quite gotten to the stage where we hang all the thousands of heads of garlic up to cure, but we did take the time to choose the heads to hold back for next year’s seed. “That dude” says that using the very biggest bulbs for seed results in an inconsistent harvest - some very large bulbs and some very small ones. He recommends planting bulbs averaging 2-2.5 inches, which results in a more uniform bulb size at harvest. Mat and I spent about an hour selecting, bunching, and hanging up the seed, which according to him is the most intentional they’ve ever been about it. This time next year we’ll see whether “that dude’s” advice worked in our case. This week also brought a bumper crop of basil, which when combined with the garlic we just harvested screams out for some pesto-making. Perhaps because our tomatoes haven’t been coming in strong yet, we hadn’t really been selling much basil at the markets, which didn’t really make us eager to harvest all of the basil we needed to to keep the plants from flowering too early. So I had the idea that we sell pesto-making kits with a recipe included. 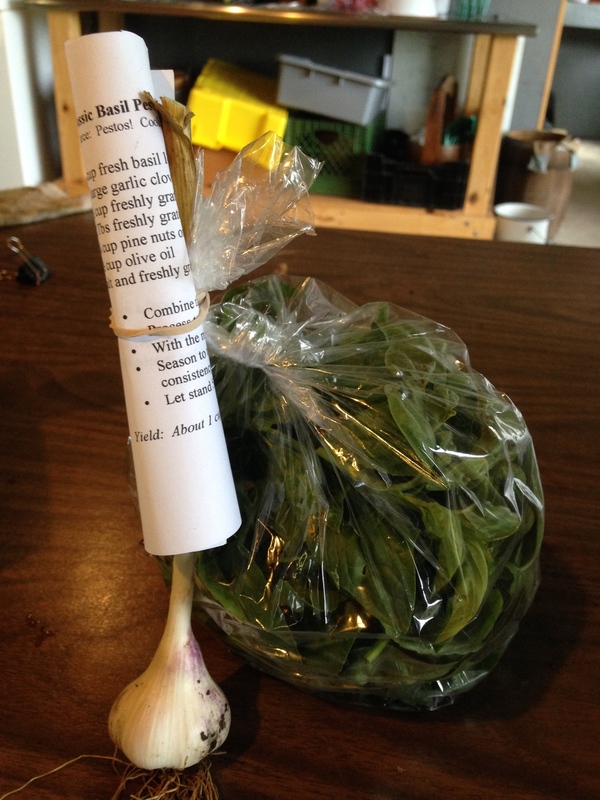 We packed large bags of basil, banded them and attached a head of garlic and the rolled-up recipe. We ended up selling much more basil at the market than we otherwise would have, and I think our customers really got excited about it. It’s this kind of never-ending problem-solving that keeps farming interesting season after season, I think. Eating: green garlic, homemade pesto, new potatoes, zucchini, wedding cake!